Preregistration - Marienville Volunteer Fire Company, Inc. The Tour-De-Forest is a an ATV leisure ride through the scenic Allegheny National Forest on designated forest roads and trails that are not usually open to ATV traffic. The Tour-De-Forest has a very low difficulty level and is good for riders of all ages and experience to enjoy. 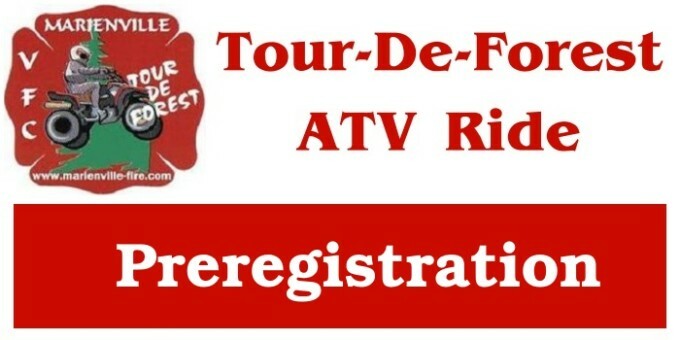 This event is put together for ATV enthusiast to have the opportunity to ride and experience different areas that are not normally open to ATV’s. We hope you have an enjoyable time with us. As you may already know, for every 2-DAY registration the participant will receive two meal tickets. The first ticket is redeemable for an All-You-Can-Eat pancake breakfast that is available at the MACA building sponsored by the Lions Club. The second ticket is redeemable for a lunch that is available at the food court along the Tour-de-Forest route sponsored by the Farmington Ladies Auxiliary or at some of the local restaurants. The participating restaurants can all be accessed by ATV and the ticket value will be deducted from the final bill. The ticket value is currently $3.00. Tour-De-Forest Rules, State and Federal Laws change frequently. IMPORTANT RIDER AND PASSENGER INFORMATION PLEASE READ CAREFULLY!! The Tour De Forest is always scheduled on the third weekend in May and the first weekend in October.